I am five weeks behind on my Project Life album. I find that this happens almost every year in the fall. Things get busy, I get behind, and it’s time for some Project Life catch-up. I’m sure I’m not alone in this behind state. Being behind used to really stress me out, but now I know how to tackle things and get caught up. Rather than share a spread today, I thought I would share my process for catching up. These tips are also very applicable if you are just starting a new Project Life album. Look through your calendar and refamiliarize yourself with the weeks that have past: This is important. Make notes in your calendar if there is anything you want to be sure to include in your album. For instance, I want to include this post from Matthew’s trip to Guatemala, so I noted in on my calendar for that week. I also made notes for journaling cards that I want to write of events that I didn’t have any photos of. Add ephemera: Have movie tickets, receipts, hotel key cards, etc. in a stack on your counter because you have been saving them for Project Life? If so, get them slipped into your album for the appropriate week. Then the items are ready to go for when you start working on your pages. Organize photos: The system that works best for me for organizing my Project Life photos is to create folders for each week. I then drop all the photos that I want to use in those folders. Spend an evening going through your photos and selecting your favorites for your album. Plan your layouts: If you are like me, having a plan for your layouts is helpful. I find it even more helpful when I am working on multiple weeks because I can see exactly where everything is going to go. It also keeps me on track since I likely won’t catch up in one sitting. Develop photos all at once: If possible, develop your photos all at once. This will likely make your photos more affordable because many developers offer price breaks on larger quantities. 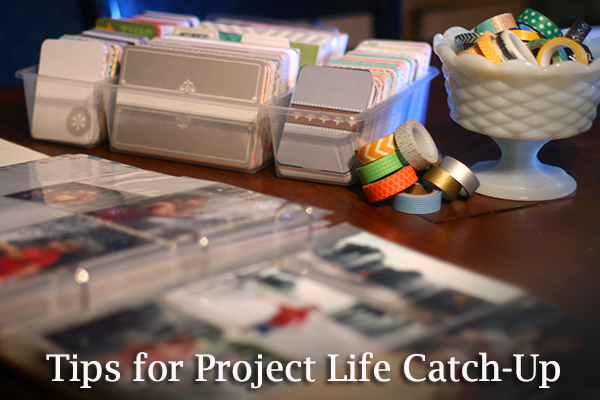 When you get your photos, slip them in your Project Life page protectors all at once. It’s so gratifying to have all those photos in your album. You can then go back and do your journaling cards as time allows. Keep it simple: This is not the time to bust out the sewing machine and get fancy with your Project Life layouts. Simply get the photos in, the journaling done and move on! What are your tips for Project Life catch-up? Where it that great card organizer from? Love it – need it – and can’t find it either. Do you know the name or have a link? My biggest tip for catching up and staying on top of Project Life is your #6: KEEP IT SIMPLE! I second the KEEP IT SIMPLE. I also have been keeping notes in a comp book I picked up at Back to School time to keep some notes. That has helped keep me on track when I needed to skip a week. New to PL – love the idea of putting memorabilia in the correct week. Recently, I began filling out my journaling cards with snippets of what has happened each day and slidding them into place so that I am ready once the photos are developed. It’s also a nice way to keep track of little things that have happened and want to include even if I don’t have a corresponding photo. Since I have so very many journaling cards, if I end up wanting to change things later on, it’s not a big deal if I end up rewriting to match my layout better or if it ultimately ends up not being included. Due to a major move from overseas back to the States this summer, I am waaayyy behind! I left off at week 22! But I do have a plan! Because I blog about my project life layouts and I want to finish my album by the end of the year, I am planning on doing 2 layouts a week: the current week and a week that I am behind on. For example, this week I am blogging about Week 39 and Week 22. I was good about keeping my photos organized over the summer in iPhoto and I had the weeks marked on iCalendar. Wish me luck! I have found that when I get behind it is key for me to resume as close to the present and slowly work on the past as i get extra time. Otherwise i just get so overwhelmed, the weeks keep piling up and it is harder to get back into the groove. Thanks for all the helpful tips! Where did you get your clear plastic PL card holder? My layouts are always super simple, but even more so when I’m trying to get caught up. I always print several weeks at a time as I don’t live in/work in a town with a photo developer so I usually order them online. I like to put a movie in, grab the laptop and work on the bunch of weeks’ pictures. I make a sketch of each week’s layout in a notebook so I know right where everything belongs. Then I spend an hour or two cutting and slipping them in the page inserts when they arrive. I have a little pocket calender that I used to be good about writing what happened. Not so much since the summer. But I’ll go through Facebook or text messages to jog myself of things I wanted to include. How do you keep the papers from sliding out of the sleeves? I know there’s gotta be a trick! If someone, or your child, wants to look at the album, I’m afraid they’ll all slide out. I’m already having issues with that part of it. I love it all. I just need a tip for that!! I haven’t really experienced that… sorry. Are you using all Project Life products?